The 4th OST (original sound track) for JTBC drama series Fermentation Family (Kimchi Family) is released February 13th, 2012. The Fermentation Family OST part 4 includes a song with the title of Beautiful Memories (기억으로 아름다워서). 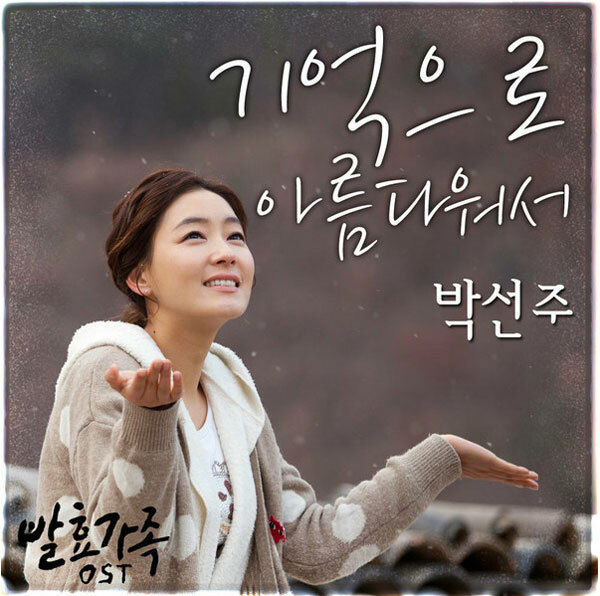 The sorrowful ballad song of Beautiful Memories is sang with the thrilling voice of Park Sun Joo (박선주). Park Sun-Joo who is a sing-a-song-writer known as the “vocalists of vocalists,” is also the music director for the O.S.T. and participated in the lyrics, music, and vocal for the song. The flow of the first half that is delivered in a calmly and softly, the contrasting expression of the chorus in which sadness overflows to the point of bursting out, and Park Sun-Joo’s sorrowful voice combine to perfect the song, touching the viewers’ heart with the added picturesque scenes of the drama.